007 Legends was delisted from Steam on November 24th, 2014. It was likely delisted around this same date on PlayStation 3. The game was not released digitally on Xbox 360, nor was it available to download on Nintendo Wii U. It remains available on physical media. Like other licensed titles from Activision, 007 Legends’ short window of availability implies the game was released to capitalize on the company’s access to the property. The game was no doubt delisted due to the expiration of the Bond movie license from MGM Studios. 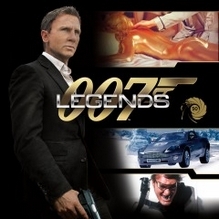 “A first-of-its-kind Bond video game, 007 Legends features an original, overarching storyline tying together five classic Bond movie-inspired missions plus a sixth mission based on this year’s highly-anticipated movie — SKYFALL — which will be available post launch as downloadable content, to offer the most diverse Bond gaming experience yet! As with the feature films, 007 Legends equips players with state-of-the-art spy gadgets, an arsenal of weapons and sleek vehicles as they jet off to exotic locations and utilize Bond’s quick wits, class and style to take down notorious villains and their brutal henchmen and perform impressive stunts.